Starbust Printing & Graphics employs offset printing where applicable. Offset printing is a widely used printing method which involves an inked image being transferred (or "offset", hence the name) from a printing plate to a rubber blanket, and then finally to the printing surface. Oftentimes offset printing is used in combination with the “lithographic” process – based on the repulsion of oil and water – and the offset technique employs a flat, or “planographic”, image carrier, on which the document in the printing process obtains ink from ink rollers, while the non-printing area attracts a film of water. This keeps the non-printing areas ink-free. 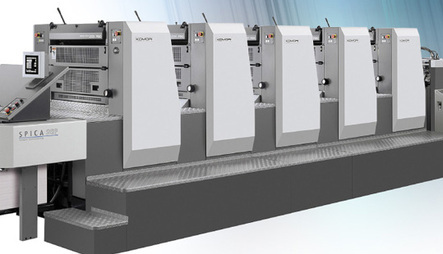 There are many advantages to offset printing, and these include a consistently high image quality (sharp and clean images), quick and easy production of printing plates, longer printing plate life (compared to direct lithographic presses), as well as cost-effectiveness – the more you print, the less you pay per page, because the vast majority of the price goes into the preparation before the print process. Any additional paper printed incurs the cost of only the paper and ink used in the process. Finally, offset printing allows for high-speed and high-volume printing.